We went to the beach last week and had a lot of fun. 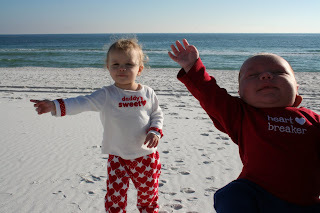 Both kids loved the beach (Kimber actually told me himself!). Grammie was kind enough to let us go with her and ride the 8-10 hours it took us to get there. Needless to say, we were crazy by the time we arrived! But it was great! They actually did really well. 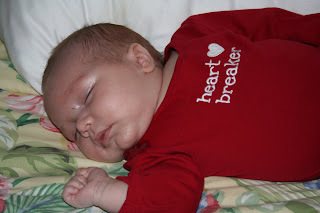 Here is Kimber chilling on the couch in his Valentine outfit. 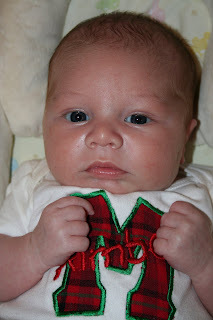 I know he is a heartbreaker and will be one when he gets older...just look how pretty he is. My mammaw says he is too pretty to be a boy! This is Addie Lee sticking her feet in the water. 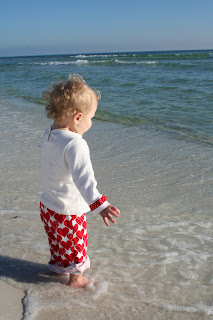 She loved the beach last year but it was even better this time. She wanted to actually get in the water but I just let her put her feet in it! I can't wait to go back this summer with Kimber, Addie Lee and Olivia. I know they'll have a great time! I'm not sure what was to their right, but obviously they both wanted me to look that way! Addie Lee just hanging out and trying to get the sand out of her toes. 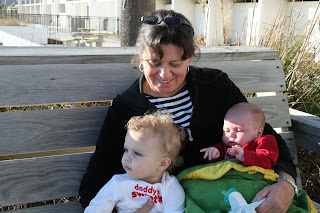 Grammie, Addie Lee, and Kimber all relaxing while listening to the waves crash. yes, January 9th was probably the coldest day in LA history and my brother got married outside! For all of you wondering...the only answer I have is that, yes, he must be nuts! And no, he didn't get it from me! 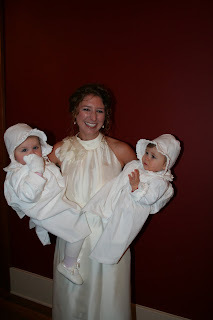 However, they did have the cutest flower girl in the history of weddings. 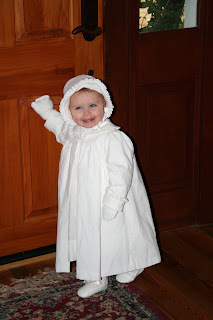 Addie Lee did not get cold b/c her smart mother dressed her in 4 layers on top and bottom plus the coat, hat, and two pair of gloves! See how cute she was! This is Addie Lee sporting her thermals and mentally preparing for the wedding! 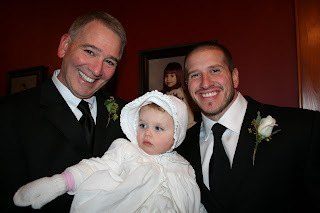 Doc, Addie Lee, and the insane groom! 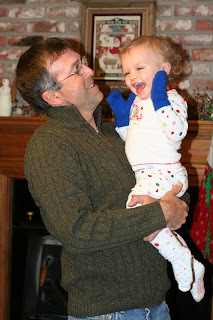 Yes, his name is Lee but don't tell him Addie Lee is actually named after my daddy, not him! You may be wondering if Kimber made a debut on that cold day. After much discussion with him, he agreed to come to the wedding if he did not have to go outside or be around a lot of people with germs. So, he came and took pics and then left...he is in our family pic at the top of the blog. Well I have decided to buy stock in Enfamil becuase it is WONDERFUL! Yesterday I bought an overpriced, small can of Enfamil RestFull Lipil for Bedtime Feeding. It says it is "specially designed to thicken in your baby's tummy and digest slowly....so you both can rest better." I was a little skeptical of this formula, but I didn't have anything to lose but $14.99 + tax. Kimber has been sleeping 4 to 4 1/2 hours at night before a feeding but any extra time I could get would be great. Dustin has gone to the hunting camp so I had night duty last night and tonight. So, last night I gave Kimber the RestFull at 10:30 and we went to bed. At 1:30 I was awakened by some whimpering; however, Kimber had wrestled his way out of his sleep sack. I simply re-velcroed him into the sack and went back to bed. To my surprise I did not hear another cry until 3:50. To say the least I was excited....that's almost 5 1/2 hours. I can function on that. Not to mention that I fed him and he slept until 7:30. However, I was awakened by Addie Lee at 6:30. But, I simply put her in the bed with me and we snuggled until she fell back asleep. I sure wish I had a camera on my bed this morning. When Kimber was getting ready to eat I put him in the bed with me also. Addie Lee and Kimber were on each side of me in the bed....it was the sweetest thing! Needless to say, I think I will now purchase Enfamil stock...they have won me over! We have had one great month at our house! Kimber is the best baby I could have imagined! Addie Lee is a great big sister and loves Kimber. She also loves having her own life size baby and baby toys! The first words out of her mouth every morning are "baby." She then checks every possible spot he may be sleeping. Once she finds him she is satisfied. I love being a mom and I thank God for all of the many blessings (the two major ones, Kimber and Addie Lee are wonderful reminders) he has given us. I could have never imagined I could be so happy. I have posted lots of random pics so I could catch everyone up on what's being happening with the Morris Crew! 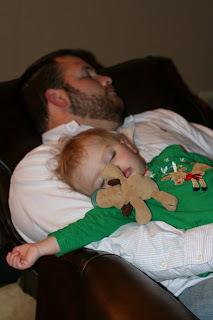 As you can see the past month has worn us out! Addie Lee and Kimber "gave" Olivia this push toy for Christmas. 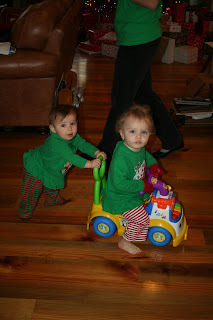 It doesn't look like Addie Lee wanted to actually give it up, but Olivia loved pushing Addie Lee around. 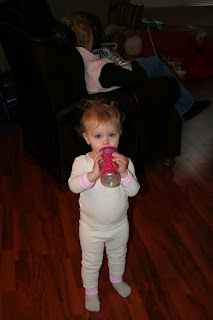 Addie Lee enjoying her Pop and the mittens Mammaw gave her...she loves those mittens! If you can't tell she has Pop wrapped around her little fingers. 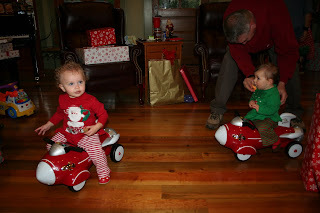 Doc and Grammie gave Addie Lee and Olivia these Red Rockets for Christmas. They rode them around all night. Addie Lee flies to Jupiter at least 5 times a day now! This is Kimber's stash that Santa left for him. 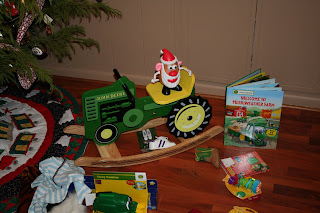 Kimber slept through most of Christmas but I'm sure he will enjoy these toys later. For now, Addie Lee is enjoying Kimber's toys and breaking them in for him. On Christmas morning Addie Lee was overwhelmed by the toys, but thought both stacks were for her! 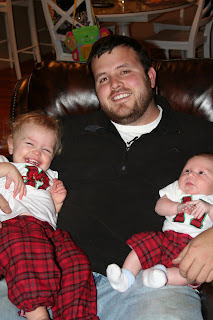 This was the best Christmas yet and I know they will only get better. 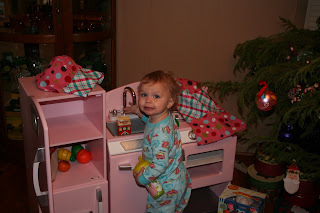 Addie Lee loved the kitchen set Santa brought her for being such a good girl. She loves the faucet...she's gonna be a germ freak like me! Patrick's "inlaws" gave us these cute jammers! I love putting the kids in matchingclothes...they're gonna hate me later! Kimber in his cute clothes! He is soooo good...I am so blessed. 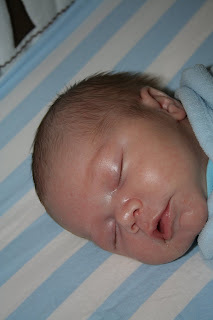 This is a pic of Kimber on his one month birthday...isn't he cute! 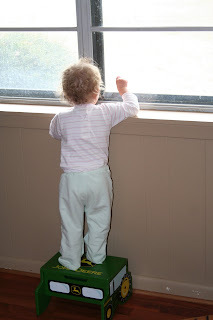 It snowed here yesterday and Addie Lee wanted to go outside but the closest she got was the window. Well, its been a month but this is the summary! I'll try to post again soon. My brother and sister-in-law (yes that's right my brother and dustin's sister) are getting married this weekend. The wedding is outside...it's going to reach record lows! Addie Lee is the flower girl so I'll try to post soon!